ARP Head Studs are made using premium grade 8740 alloy. 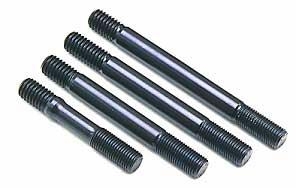 Each head stud is heat-treated to 190,000 psi to ensure complete heat penetration. ARP head studs won't stretch like the stock bolts, and will assist in dramatically decreasing the chance of head gasket failure. ARP Head Studs are a "must have" modification for any 7-bolt DSM or Evo 8/9 wanting to push 20+psi.